(CNN) - Marjory Stoneman Douglas senior Ryan Deitsch asked Florida Sen. Marco Rubio on Wednesday why he and other students "have to march on Washington just to save innocent lives." Deitsch, who survived the shooting that left 17 people dead last week at his Parkland, Florida, high school, told Rubio he has grown up in a world with drills in schools and possible active shooters. In fifth grade, he hid in a bathroom with his teacher and 20 classmates for three hours after a shooter came to his town, Deitsch recalled. "Now seven years later, I'm in a closet with 19 other kids, waiting, fearing for my own life," he told the Republican lawmaker at the CNN town hall "Stand Up: The Students of Stoneman Douglas Demand Action" in Sunrise, Florida. 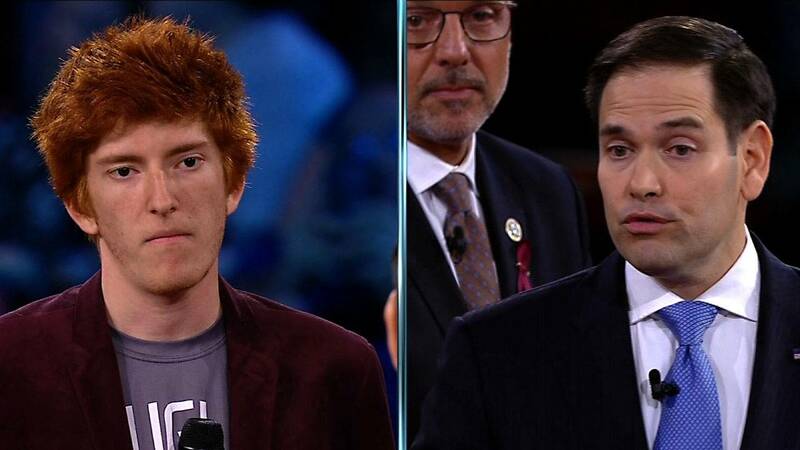 Deitsch asked Rubio why do students have to be the ones demanding action on gun control laws. "Why do we have to march on Washington just to save innocent lives?," he said. Rubio told the student: "You're right." Rubio said the country has not been able to make progress on the issue of gun control "but you do have a chance to change it." Rubio said he supports a gun-violence restraining order measure that would enable authorities to prevent someone from buying a gun or take it from them after getting reports from individuals, including family members. Three states have similar measures, Rubio said. "And that person will have due process," Rubio said. He added: "Because I believe that if that were in place in Florida ... it could have prevented this from happening." "If I may, I do appreciate your words there. But that feels like the first step of a 5K run," Deitsch said. Rubio said: "It most certainly is." The senator added: "I would say it's more than a 5K run ... This issue will take more than a 5K run because there's so much to do. But that is an important step, and if that happens in the next three weeks, it'll be because of what you guys have done." According to a mission statement for March For Our Lives, students across the country will converge on Washington next month to say the nation can no longer wait to tackle issues of school safety and gun control reform.